Sock Monkey Fun has an amazing Gallery of over a hundred custom made Sock Monkeys. They also have Patterns, kits and bios on Sock Monkeys. Sunnyflower farm has inspired numerous crafters and monkey makers over the years. Miss Melanie's imagination and creativity is seen in all the monkeys she designs. Sock Monkeys are not limited to North and South America! Socky takes on the challenge to promote the plight of Sock Monkeys in Japan. Fluff TV holds nothing back. From movies, disturbing monkeys to stories of sock monkey courage. There are usually a few monkeys for sale at any one time. Wikipedia is a great place to learn a bit about almost anything. 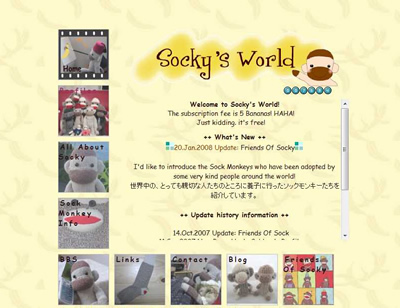 Visit Wiki and get the history and current developments in the Sock Monkey World. Home of Coco the Diva of the sock monkey world. With adventures and a number of premade sock monkeys for you need to visit S' Monkey today...or at least before Tuesday. Contact Ceru to get your Site added here.